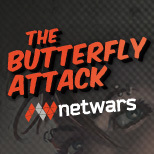 High tension: „The Butterfly Attack“, an interactive graphic novel. „The Code“, a thrilling e-book & audio-book. „Red VS Blue“ – your chance to win.